An amazing ukulele and celebrity signed guitar have come up on the eBay Auction Cause store. The nonprofit Guitars in the Classroom has collected the signatures of the “Stars, Icons and Legends of The Surfing World” on this Kohala Kanikapila-style concert ukulele and a Fender Classic Vibe Telecaster to raise funds for their programs to bring music into education. The auction will be live until Thursday night, December 20th, 2012. Access the auction by clicking here. 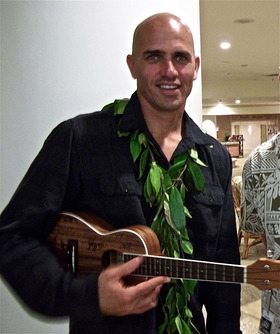 The “Surf Uke” features the 35 iconic autographs, including the following surfers: Joel Parkinson – 2012 World Champion and Pipe Masters winner; Kelly Slater – 11x World Surfing Champion and 18x Surfer Poll winner; Jack Johnson – famous musician and surfer; John John Florence – top pro surfing prodigy and #2 on the Surfer Poll; Gerry Lopez – legendary “Mr. 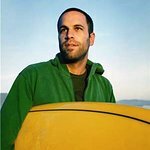 Pipeline”; Rob Machado – iconic soul surfer; Dane Reynolds – futuristic surfing hero; Shane Dorian – big wave legend; and John Cruz – Hawaiian master musician. This is a truly unique ukulele, capturing surfing brilliance of the past and today. It’s sure to be a great holiday gift or collectible for a music loving ocean aficionado. The proceeds of its sale will fund free training programs that prepare, equip and empower teachers to provide daily hands-on music making for children in the public schools of Hawaii and beyond. Additionally, the following luminaries of the surfing world have signed this precious instrument: “Soul Surfer” movie’s Bethany Hamilton; Bruce Irons; Buttons Kaluhiokalani; 2011 Woman’s World Surfing Champion Carissa Moore; rising star Courtney Cologne; free surfer/ocean activist Dave Rastavich; surf pioneer Herbie Fletcher; longboard champ Joel Tudor; Surfer Magazine founder John Severson; Jordy Smith; Josh Kerr; Julian Wilson; Keala Kennelly; Keith Malloy; Kieren Perrow; Lindy Irons – wife of the late great Andy Irons; big wave charger Mark Healy; World Champ and legend Mark Occhilupo; skater/surfer/musician Matt Costa; Owen Wright; Pancho Sullivan; First World Champion Peter Townsend; iconic Hawaiian legend Rabbit Kekai; Sally Fitzgibbons; Taj Burrow; and Taylor Knox! The Fender Classic Vibe Tele, donated to Guitars in the Classroom by the Fender Music Foundation, has been signed by music and surfing greats Donovan Frankenreiter and Rob Machado , as well as Switchfoot founding member and rocker, Jon Foreman ! This exciting auction also features a guitar that will be signed to order by jazz great Al DiMeola. To check out photos of the ukulele, the Tele, the Custom Legend 1769 ADII Ovation, and much more, visit the auction at eBay. This auction includes other great items and instruments signed by famous surfers and musicians, as well as concert tickets with artist meet-and-greets, instruments, musical gear, and much more – all supporting Guitars in the Classroom and the music they bring into classrooms every day around the country. Guitars in the Classroom (GITC) has trained over 9,000 teachers and school staff members to lead musically integrated lessons across the academic curriculum. GITC’s heartfelt mission is to make hands-on music an integral part of learning for students in their regular classrooms. Headquartered in Encinitas, California, the program is active in twenty-six states. GITC’s free, regionally-based programs train, equip and empower educators to sing, play guitar, teach and lead songs as well as compose lyrics for learning with their students. Infusing academics with music helps every kind of learner become more actively engaged, creative and successful in school, builds classroom community and provides musical access for every child. For more info, please visit www.guitarsintheclassroom.org.